Hello friends today i am going to introduce you to a new and one of the best 3D video effects and intro video making software called ” BluffTitler “. Do you want to impress your family members, friends or clients with spectacular 3D titles and intros? without the use complex and expensive 3D animation software? BluffTitler makes it easy and affordable to add 3D effects to your videos! 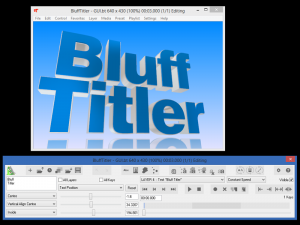 BluffTitler is a windows desktop based application which will help you to create amazing intro videos with 3D effects, its extremely user friendly and very easy to under stand software. This software is using an state of the art 3D game technology (DirectX 11, HLSL 4) to render your animations and videos in real time. which will help exporting as video is super fast. The makers of This amazing software is providing lots of video tutorials to its users which will help them to learn new tricks! super easy. In BluffTitler software you can create eye dropping 3D intro videos with the help of Complex 3D rendering techniques like depth of field , displacement mapping and cube mapping are offered as easy to use effects. What can I do with BluffTitler Software?